All Saints’ Day is special for Finnsnes United Methodist Church. On Nov. 4, church members will meet the passengers of the Hurtigruten ferry with offers of communion and the opportunity to light torches for loved ones who have passed away. The Hurtigruten ferry is a commercial liner carrying goods and people up and down the long Norwegian Arctic coastline, binding small towns and fishing communities together. In November, the darkness of the Arctic winter is closing in for the people in Finnsnes, a small town far north of the Arctic Circle. We talked with The Rev. Roy-Frode Løvland, pastor of Finnsnes United Methodist Church, about how the All Saints’ Day tradition began and what the response has been like. 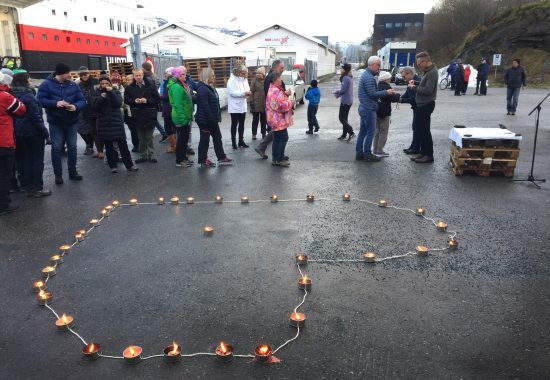 The congregation of Finnsnes United Methodist Church in Finnsnes, Norway, joins passengers from the Hurtigruten commercial ferry in lighting candles in memory of loved ones to celebrate All Saints’ Day. Photo by Lise Løvland. What was behind this idea? I’m not sure where the idea came from. We were having a lot of discussions about breaking out of the physical church or using alternative sites for service. We are rebuilding our church, and this gave us a good push to rethink many things. All Saints’ Day is a day that appeals to many people, so we thought this would give us a good opportunity to offer people a chance to see holiness in their own everyday lives. And when our intentions were to serve the community, and not to recruit new members, we focused on people traveling. Our goal was to give people a place to turn their eyes to God. How were you met by the community when you presented the idea? We contacted the owner of the dock and got permission and instructions for where and when. We were met with only positivity. We also contacted Hurtigruten and asked them to inform the passengers. It’s a short stop on a long journey, so we were relying on good information before docking so that those who wished to participate knew to get off and walk to the right place. Their staff were very helpful and put the information on the screens all over the ship. How did you prepare the dock? We set up a sound system and all we needed in plenty of time. It was not meant to be a big show. We just wanted to meet the passengers with music to welcome them. When the ship arrived, the music played and people both on the dock and on the ship stopped to listen and see. When the doors opened on the ship, I invited people to receive the Lord’s communion, with emphasis on this being open for all. A short devotion with the Lord’s Prayer was recited in Norwegian, English and German. People were also invited to light a small torch and place it in a heart-shaped area that we had prepared, in memory of their loved ones. What reaction did you get from the passengers? When people came toward us, it was obvious that this had a deep meaning for them. Many, both young and old, had tears in their eyes. Some first lighted their torch and stood silent for some time, watching the flames. They then came to the small altar, made of simple materials and covered with a white linen. Communion is prepared to be shared with church members and ferry passengers. Photo by Lise Løvland. How did the people from the church who participated experience this? To meet strangers with communion is an almost indescribable experience. It was obvious that this was an unexpected gift for very many passengers. They stood with tears in their eyes, receiving wine and bread listening to the Norwegian words for, “This is the body of Christ. This is the blood of Christ.” I hope something eternal was planted in their heart. Many from our small congregation participated. They handed out torches to those that wanted to light one for their loved ones, they made a fire and made plenty of warm coffee, talked to people and helped with the communion. Since our service was moved to this place, many dressed for the cold and participated alongside the passengers. Did you get a response from the local community? The response has been overwhelming. We did not count the number of people; our focus was to be present for those that wanted to take part in the communion. It was heartwarming to see the stream of people from the ship, the people on the dock, those waiting to get onboard and our own members coming to communion. It was also moving to see the heart-shaped outline of flickering torches, laid out with love. We found great joy in the conversations and laughter around the bonfire from those that stopped for a coffee and a chat. I believe many of us that were there felt the presence of God strongly. Meeting people on “neutral” ground with a clear message gave us a new understanding of the word “fellowship.” We did not need church affiliation, an administration or a consecrated building for belonging. Seeking God together was enough. And in this rare fellowship, we caught a glimpse of who God is. It inspired and strengthened our belief in God. How has this experience affected the congregation? We almost immediately concluded that this was something we must do again and explore more. What kind of meeting places can we create in people’s everyday life? How dependent are we on recruiting new members in our outreach? What is created in these small meetings between us and people passing by in the communion? What does it create in us? How will it affect us as a church if we seek opportunities like this from now on? Sunday, on Nov. 4, we are once again standing on the dock inviting people to share communion and remember lost ones. We do not know how this will affect those we meet, but we do know what it means for us. We are God’s church in the world. When we freely share God’s gifts in this way, it also transforms us who are given the mission to share.